Here are some of the observing sites used by SJAA members and other amateur astronomers around the South Bay. The maps shown below are interactive and can be zoomed and panned. Click on “View Large Map” below each map for a full blown Google map where you can obtain directions to the location. Houge Park is located near the junction of highways 17 and 85, near the border of San Jose and Los Gatos. Use the map below to find your way around once you are there. 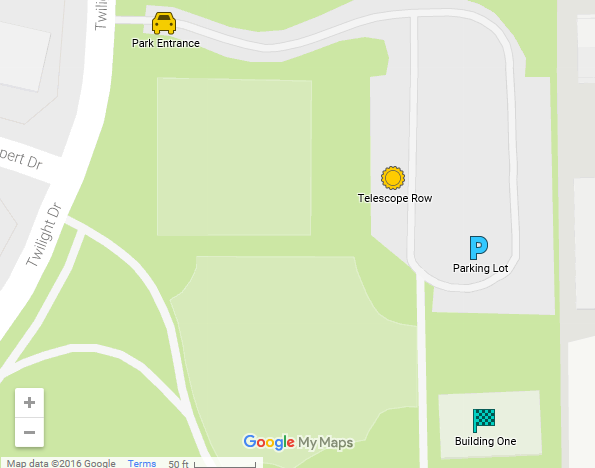 Enter Houge Park at the yellow car icon on the map. This is the site of our city star parties and the location of our monthly general meetings. Houge (rhymes with “Yogi”) Park is in San Jose, near Campbell and Los Gatos. This location is very convenient for city residents, and a good location for introducing people to amateur astronomy. Views of the constellations, brighter deep sky objects, the moon and planets are typical observing targets. Between the parking lot and tennis courts is a sidewalk where public star parties are held. The meeting hall is directly ahead (south) of the parking lot. 1st time at Houge Park? Look for entrance next to tennis courts off of Twilight Drive. Restrooms: on the other side of the the hall. 7/24 open access, just pay $6 at the machine at the entrance if no ranger is present. Restroom: 3 Porta potty toilets opened 7/24. Restrooms: 1 Porta potty toilet opened 7/24. 7/24 open access, just pay $6 at the iron pole. Restrooms: 3 Porta potty toilets opened 7/24. Hunting Hollow GPS Coordinates: N 37 04 33.88 W 121 27 59.54. 7/24 open access, just pay $8 at the iron pole. Restrooms: 1 Porta potty toilet access unknown. The iron ranger (iron pole pay drop-off) is up the road among the main buildings. You have to drive up to it first, pay, then drive back down to the Overflow Lot. Make sure you keep the receipt tab with you. Restrooms: 1 permanent toilet access unknown. Fremont Peak State Park is south of the village of San Juan Bautista, about a 1 hour drive from San Jose. There are several areas within the park used by astronomers.The areas near the ranger house (Observatory and Ranger row on the are managed under contract to the state by the Fremont Peak Observatory Association. Contact FPOA for access if you want to set up a scope. FPOA runs a summer program at this location using their 30″ telescope. For more information contact FPOA. The Coutler and SW Lot areas are managed directly by the park. The annual CalStar dark sky party is at Lake San Antonio in southern Monterey County. Lake San Antonio is approximately 2.5 hours south of San Jose. Here is some information about visiting at other times. See the CalStar site for maps and directions. Williams Hill is a hilltop about ten miles north of Lake San Antonio. Most of the land is BLM-owned; there is also a large microwave tower(s) installation. The “hill” is actually a fairly long ridge running north-south, with a road along the ridge-top. The high-point and the microwave towers are at the south end. There is a BLM campground. And ‘informal’ camping is allowed. At the top, you can continue straight (actually bearing left) and you will go down the far side toward Lockwood and LSA. Or turn sharply left to stay on the ridge, heading south, and come to the BLM campground and eventually (2.5 miles straight-line, prob five by the road) a field near microwave relay towers (few trees no lights at night) at 35.9526 n 121.0016w. Or turn right on a slightly poorer road and get to a big parking lot at 35.993n 121.024w. Williams Hill is about as dark as LSA. It figures to have better seeing, because it can be in the Pacific air-flow rather than being “in a hole”. Sites at the southern part of the ridge are higher-altitude than northern sites.